What are the key military counter terrorism techniques and strategies? From use of Special Forces to targeted killings and covert intelligence – what works, when and why? 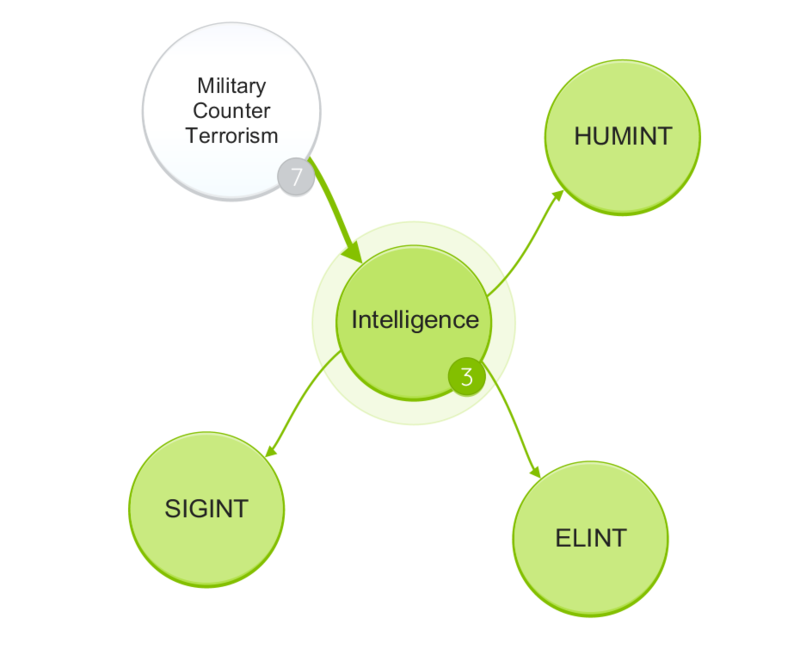 Military counter terrorism techniques and responses are diverse. In evaluating their suitability and effectiveness as policy instruments, it is helpful to contextualise them within five simple categories (loosely derived from (Hughes, 2011, pp. 37-57)). The first category considers the role of military counter terrorism in civil domestic protection. Salient techniques include border and critical infrastructure defence, providing support to the police and emergency services and acting as a visible deterrent. The role of the military in France and Belgium in the wake of mass casualty attacks against civilians is illustrative. The second category examines civil domestic protection in the context of military deployment in response to prolonged civil emergency. Counter terrorism support operations conducted by the British Army in Northern Ireland between 1969 and 2007 provides useful examples. The third category explores military counter terrorism techniques used in wars in Iraq and Afghanistan. Targeted killings, air and drone strikes, Special Forces deployments, enhanced interrogation and the ‘industrialisation’ of military counter terrorism are considered. 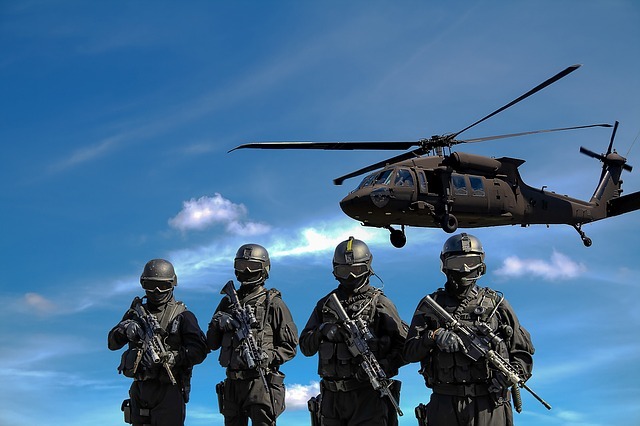 Actions outside war zones, including pre-emptive, revenge attacks, international hostage rescue and evacuation operations are situated within a forth category. Drone strikes and the killing of Osama bin Laden in Pakistan or the US hostage rescue attempts in Iran in 1980 are pertinent. 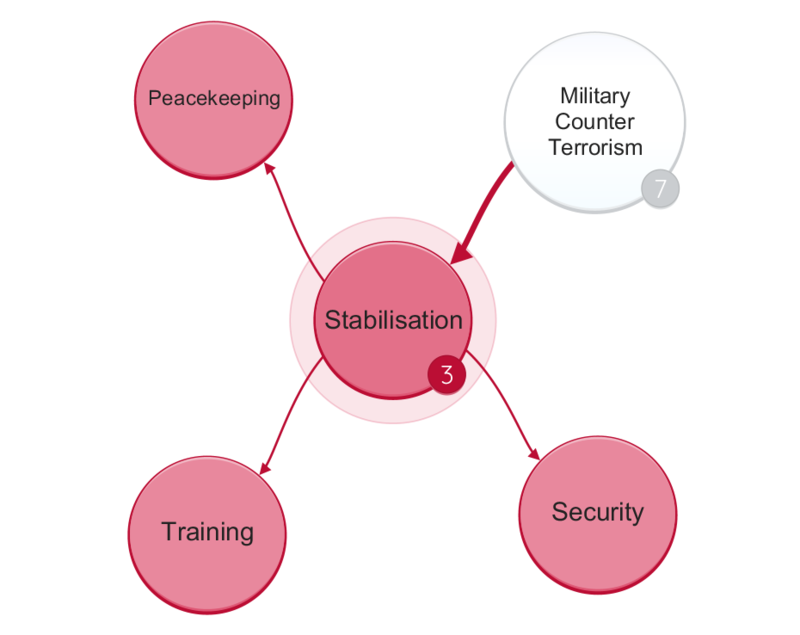 The fifth category examines techniques and responses used in international stabilisation efforts and the development of military counter terrorism capabilities of foreign states. This is an important policy area focused on countering risks from transnational terrorists and the exploitation of state or regional fragility (Howard, 2016, pp. 1-17). 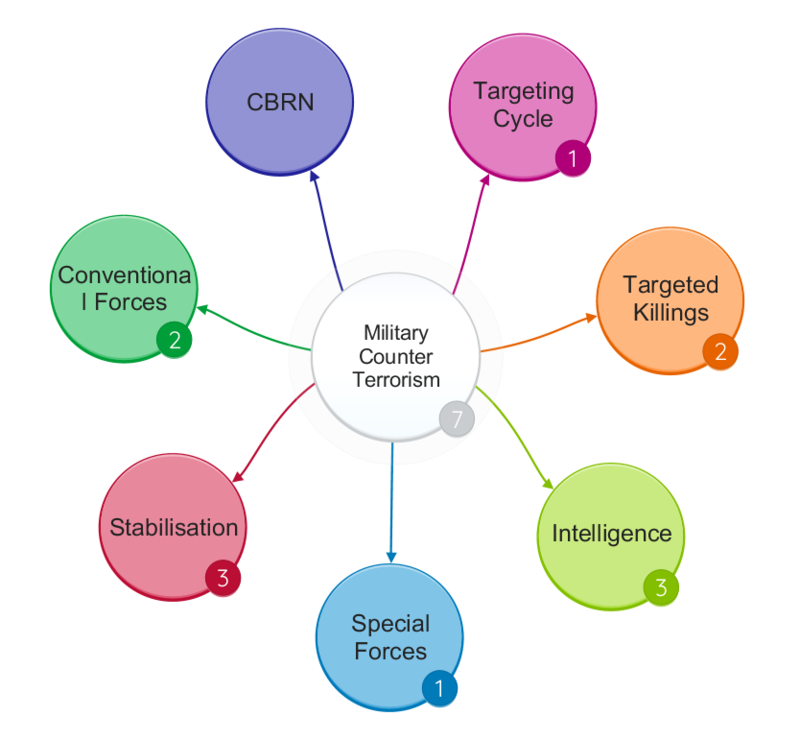 By laying out each category, a spectrum of postures is formed traversing military counter terrorism and civil defence under police primacy (categories 1 and 2), to military primacy ‘within and around’ a formalised conception of war (categories 3 and 4) to conflict prevention and transformation (category 5). 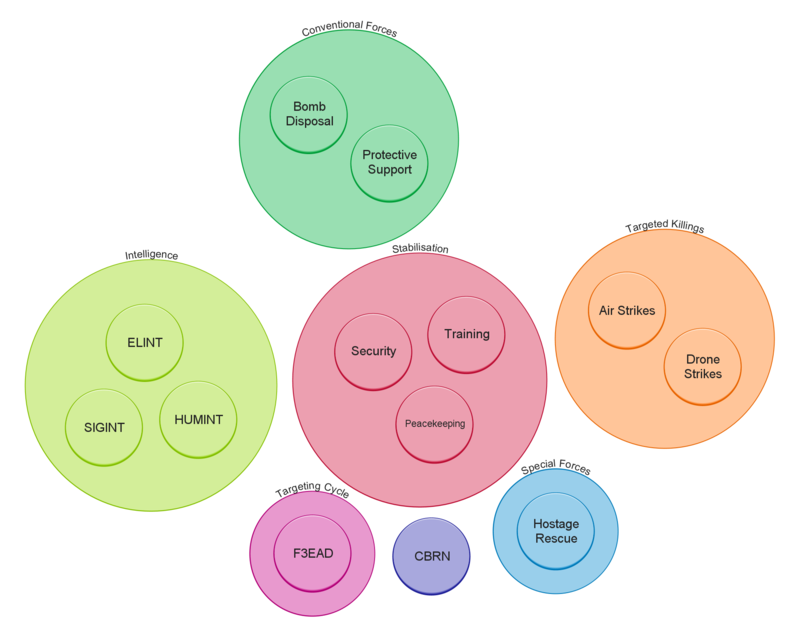 An evaluation is presented detailing the effectiveness of military counter terrorism responses within these contextual frames. The first category considered is that of military counter terrorism techniques used in support of the civil authority under the primacy of policing. The use (or threat of use) of Special Forces in domestic counter terrorism operations is germane. From the Special Air Service (SAS) assault on the Iranian Embassy in 1980 (Pearson and Firmin, 2011, p. 188) to psychological intimidation of the IRA gang at the Balcombe Street Siege in 1975 (Moysey, 2007, p. 279), Special Forces operations have exhibited high levels of operational effectiveness. The protection of the London 2012 Olympics (Bloxham, 2011), providing covert spotters around shopping centres and tourist sites (Hughes, 2016), rapid response and police training illustrate the breadth and diversity of tasks. Beyond Special Forces, military deployments to Heathrow Airport near London in response to an al-Qaeda (Bamber, Craig and Elliott, 2003) and Palestinian terrorist plot (Merry, 1974), (Pandey, 2008, pp. 221-222), raise questions over proportionality and effect. It is debatable whether public confidence was weakened or emboldened by what may have appeared to some as ‘security theatre’. In France (Matthews, 2016) and Belgium (Steinhauser, 2015) high military visibility has been commonplace in the aftermath of attacks such as those in Paris, Nice and Brussels. A reluctance to deploy troops on the streets of the British mainland (MacAskill, 2015) is perhaps unsurprising, given the ramifications this would have for social norms. Additional military counter terrorism techniques including covert intelligence support, bomb disposal and signals jamming are effective add-ons to civil authority capabilities. Cyber terrorism is an emerging threat (Bumiller and Shanker, 2012) and military proficiency in deterrence (Nye, 2017, pp. 9-15) and electronic warfare are extensive. Sharing knowledge and threat insight with government and civilian partners is important in developing operational effectiveness across the various layers of cyber defence and critical national infrastructure (Lowenthal, 2016, pp. 383-394). Effective military responses are imperative in border, costal and airspace protection. The interdiction of drugs, arms and people trafficking denies terrorists weaponry, funding and operatives. The Royal Navy has successfully tracked arms shipments in international and national waters leading to their seizure (Harnden, 2011). The Royal Air Force provides essential defensive capabilities to UK airspace. On 9/11, the United States Airforce faced the horrific prospect of shooting down hijacked passenger aircraft. The operational consequences of such a policy decision are mercifully untested. 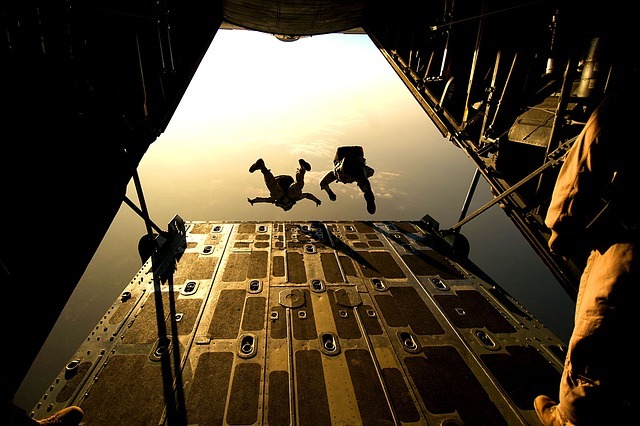 The military would play a significant role in containing, mitigating and eradicating threats of Chemical, Biological, Radiological or Nuclear (CBRN) attack. This may extend to large scale evacuation, quarantine and clean-up operations. Civil nuclear accidents, isolated anthrax (Nasaw, 2008) and sarin gas attacks (Osaki, 2015) provide some indication of the challenges faced in providing operationally effective responses. 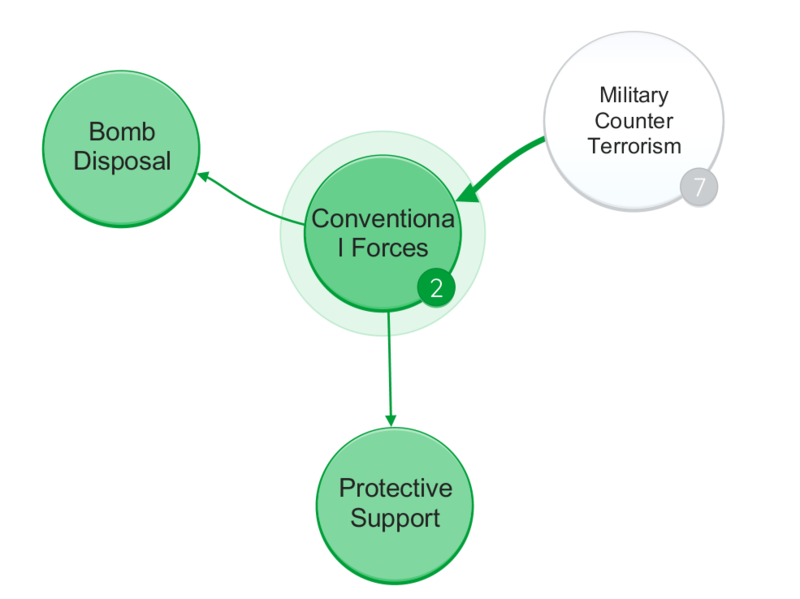 The second category to consider is the use of military counter terrorism techniques in prolonged domestic conflict such as that in Northern Ireland. Key combatants included the Provisional Irish Republican Army (PIRA) and various loyalist terrorists. Between 1969 and 2007, the British Army was deployed in support of the Royal Ulster Constabulary (RUC) and latterly the Police Service of Northern Ireland (PSNI). Extensive military counter terrorism operations were conducted including the use of Special Forces and human and signals intelligence collection. Overt and covert cameras and listening devices were used and military intelligence ran networks of Covert Human Intelligence Sources (CHIS) within paramilitary groups. The development and handling of Stakeknife, an informer inside the PIRA’s internal security unit (Harkin and Ingram, 2004) powerfully illustrates the effectiveness of military intelligence’s cultivation of CHIS. Operations by Special Forces in Northern Ireland have been controversial (Bamford, 2009, pp. 270-275), (Hewitt, 2008, p. 26). In assessing the operational effectiveness of lethal outcomes, the risk of disenfranchisement and radicalisation must be considered. A contrasting argument that lethal operations accelerated the end of armed conflict cannot wholly be disregarded. This does seem to have played lesser importance however than intelligence (Matchett, 2016, p. 37) and widespread infiltration of paramilitary groups throughout their command structures. Stop and search operations, mass raids on private housing and abusive interrogation were central to republican victimisation narratives. On the balance sheet of counter terrorism measures, quantifiable attributes such as number of terrorist plots disrupted, quantity of arms seized and terrorists prosecuted versus successful terrorist attacks, loss or injury to military and civilian personnel and the economics of attacks on commerce (Drakos and Giannakopoulos, 2009) were important. Levels of community support and confidence, fluctuations in hostility and increased radicalisation were also key indicators of effectiveness degradation and blowback. Signals Intelligence (SIGINT) and Human Intelligence (HUMINT) successes in Northern Ireland included weapons dump monitoring and installation of tracking devices in arms (Urban, 1996, pp. 119-122). Covert bugging of cars and homes of terrorist suspects also proved fruitful, but occasionally led to embarrassing mistakes (Hartnett, 2016, pp. 149-152). Public telephones were monitored (Ibid., p. 172) and intelligence constructed using an array of collection methods extending to observation posts, vehicle checkpoints (VCPs) and routine patrolling. Operational difficulties and mistrust between the British Army and local security services existed. The challenge of developing shared and actionable intelligence in a multi-agency setting is not unique to Northern Ireland (Aid, 2009, pp. 55-68). It was arguably further complicated by poor cooperation between the security services in Northern and Southern Ireland. Weak cross-border security was exploited, particularly by PIRA in South Armagh (Matchett, 2016, p. 147). Historical enquiries and the threat of prosecution of former soldiers (such as those involved in the 1971 killings by the Parachute Regiment in Ballymurphy (McCleery, 2015, p. 58), or on Bloody Sunday in 1972) have been contrasted with effective amnesties for former PIRA terrorists (Blackbourn, 2014, p. 164). This raises further issues about the conceptualisation of the Northern Ireland conflict, questions of ‘moral equivalence’ and the acceptability of counter terrorism measures within such contexts. 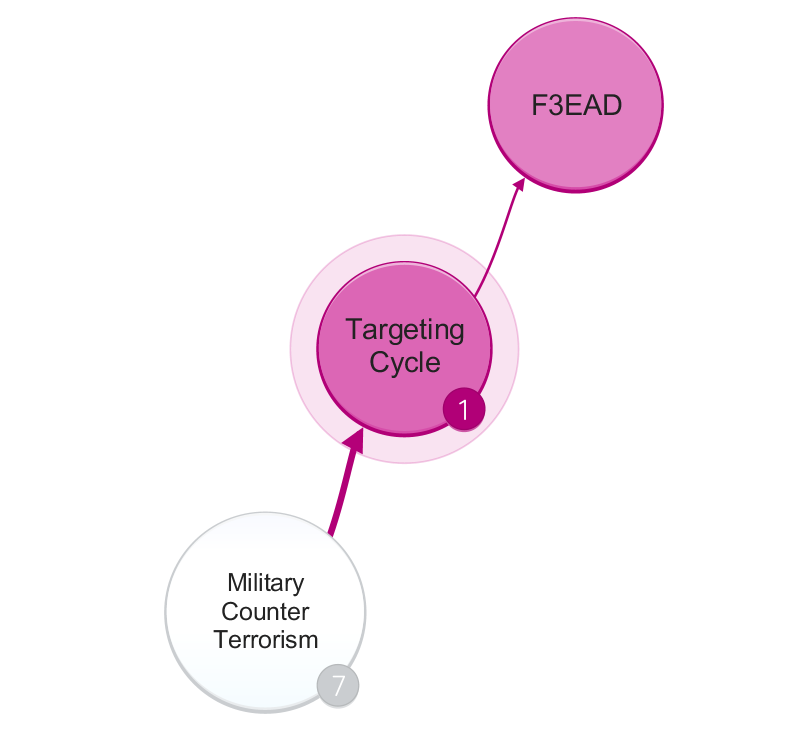 The third category to consider introduces the use of military counter terrorism techniques outside of the conceptualisation of ‘terrorism as crime’ (Miller, 2009, pp. 83-116). Perhaps the most pertinent examples in recent discourse are the conflicts in Afghanistan, Iraq and Syria. Military primacy, within a conceptualisation of ‘terrorism as war’ (Ibid., pp. 4-5) characterises the operating context. Debates on the efficaciousness of techniques including the use of enhanced interrogation and torture, targeted killings, air and drone strikes, detention without trial, extraordinary rendition and Special Forces are central. On the balance sheet of measures in this context, decapitation attacks against al-Qaeda in Afghanistan (Wilner, 2010, pp. 312-314) and Iraq feature prominently. The concerning expansion of al-Qaeda’s influence in the Middle East, Maghreb, Indian Subcontinent and Arabian Peninsula indicates the dangerous ineffectiveness of certain of these policy instruments when faced with global Salafi Jihadism and terrorist franchising. 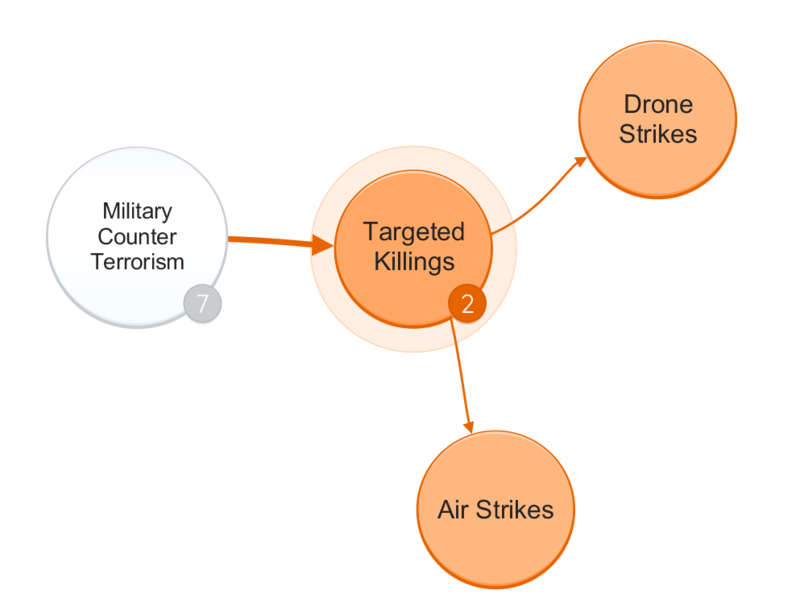 Targeted killings, be they from air or drone strikes pose a risk to non-combatants within the strike zone. There are moral and ethical responsibilities to protect innocent life and accurately and openly assess and report civilian casualties. The categorisation of all “military aged males” as active combatants (Lawson, 2013, p. 161) is somewhat dubious. This practice potentially obfuscates the impact of targeted killings, skewing (or preventing) fully objective analysis of their effect. Dead terrorist leaders are quickly replaced, although there may be a significant disruption to terrorist operations during an interregnum. The risk of blowback demands that this policy instrument be used with restraint (Cronin, 2011, pp. 31-34). There is a perennial risk that succession will deliver a more capable and ruthless leader than that eliminated (Kilcullen, 2010, p. 221). Audrey Kurth Cronin (2013, p. 44) argues that drone strikes are strategically counterproductive and likely to produce fresh enemies. Intelligence gathering using SIGINT, HUMINT, Image Intelligence (IMINT) and Electronic Intelligence (ELINT) has proven highly effective in this context. SIGINT collection against foreign targets raises fewer privacy concerns than those in domestic civil surveillance (such as under category 1 above). A key challenge with the effective use of SIGINT is the sheer scale of collection, translation and analysis. The lack of Information Communication Technology (ICT) in Afghanistan and counterintelligence awareness among some al-Qaeda operatives increased the difficulty of acquiring SIGINT. Developing HUMINT sources within tight-knit fundamentalist groups is non-trivial. The opportunities to recruit well-positioned CHIS within Jihadi networks is somewhat elusive (Aid, 2009, p. 46). High tempo Special Forces operations and the ‘Find, Fix, Finish, Exploit, Analyse’ (F3EA) targeting cycle (Urban, 2011, p. 83) bolstered intelligence gathering, particularly against Al-Qaeda in Iraq (AQI). Here, Joint Special Operations Command (JSOC) under the leadership of General Stanley McChrystal, championed the ‘industrialisation of counter terrorism’ (Ibid, pp. 91-92). This harnessed the surveillance capabilities of satellites, drones and reconnaissance aircraft, SIGINT and HUMINT and coalition Special Forces including Delta Force and the SAS. The ability to co-ordinate intelligence gathering and assessment, drive high tempo lethal force operations against AQI and use F3EA as part of ‘continuous collection and targeting’ proved highly effective. The elimination of high profile AQI protagonists including Abu Musab al-Zarqawi are among the successes (Ibid., pp. 147-162). Special Forces also rescued several Western hostages, saving them from a likely grotesque death at the hands of Islamist militants (Ibid., pp. 125-136). Significant reputational damage resulted from egregious detainee mistreatment at Abu Ghraib (Ramsay, 2009, pp. 414-415). A shortage of experienced interrogators and the nature of US counterinterrogation training have been suggested (perhaps speciously) as mitigating factors (Andrew, Aldrich and Wark, 2009, p. 316). The use of enhanced interrogation and alleged torture has done much to energise anti-coalition sentiment and resistance. The most ardent of consequentialists recognises the use of torture by a liberal democracy is highly questionable and undesirable but in the most extreme circumstances (Ramsay, 2009, pp. 415-424). There is no room to derogate from the Geneva Conventions and little evidence of the efficacy of torture. Deep interrogation and enhanced interrogation are euphemistic veils that risk creating a grey space in which liberalism itself may yield to barbarism. Complicity raises fundamental ethical and moral questions (Gaskarth, 2011). The forth category considers military counter terrorism operations against both state and non-state actors outside formalised war zones. Drone strikes and targeted killings prosecuted by the United States against targets in Pakistan, Yemen and Somalia provide examples. Ethical and legal concerns arise, particularly with extra-judicial killings in weak and fragile states. Infringing the sovereignty of a foreign state risks blowback, creating new enemies and potentially destabilising a wider geography. The killing of Osama bin Laden in Pakistan in 2011 is an interesting case. As a military counter terrorism operation it was effective and successful. The target was eliminated and “treasure trove of intelligence” collected (Bergen, 2013, p. 243). The strategic risk to relations with Pakistan should not of course be understated. The value of elimination of the target must therefore be assessed against a spectrum of potential negative outcomes. The use of Special Forces in hostage rescue in foreign states is also relevant in this category. Interesting cases include the hostage crisis in Iran (1979-1981) and in Entebbe in 1976 (David, 2016, pp. 290-313) when Palestinian terrorists were sheltered by Uganda’s Idi Amin. In Iran, Operation Eagle Claw (Beckwith and Knox, 1984, pp. 253-287) was a failed rescue attempt by US forces. The failure, mostly attributable to weather and technical problems, gifted Ayatollah Khomeini a significant propaganda coup. The corresponding reputational damage to US President Jimmy Carter likely cost him a second term in office. By contrast the ‘Raid on Entebbe’ by members of the Israel Defence Force was a successful rescue operation. Uganda’s support for the hostage takers however resulted in the loss of dozens of their soldiers. Amin reportedly struck at Kenya for its support of the Israeli operation. Ugandan agents acting on Amin’s orders are said to have assassinated Kenyan Minister Bruce MacKenzie in revenge (Muendo, 2016). These cases highlight the need to consider the totality of outcome when assessing the effectiveness of the policy instrument. The fifth and last category considers the effectiveness of military counter terrorism techniques in post-conflict, state building and stabilisation initiatives. A key area of focus in this context has been the development of enduring and sustainable capabilities of partner states. For example, coalition forces have provided extensive training to government troops in Afghanistan (Maley and Schmeidl, 2016, p. 41) and Iraq. States with poor human rights records, corrupt or capricious leaders make for complex, even unsavoury partners. 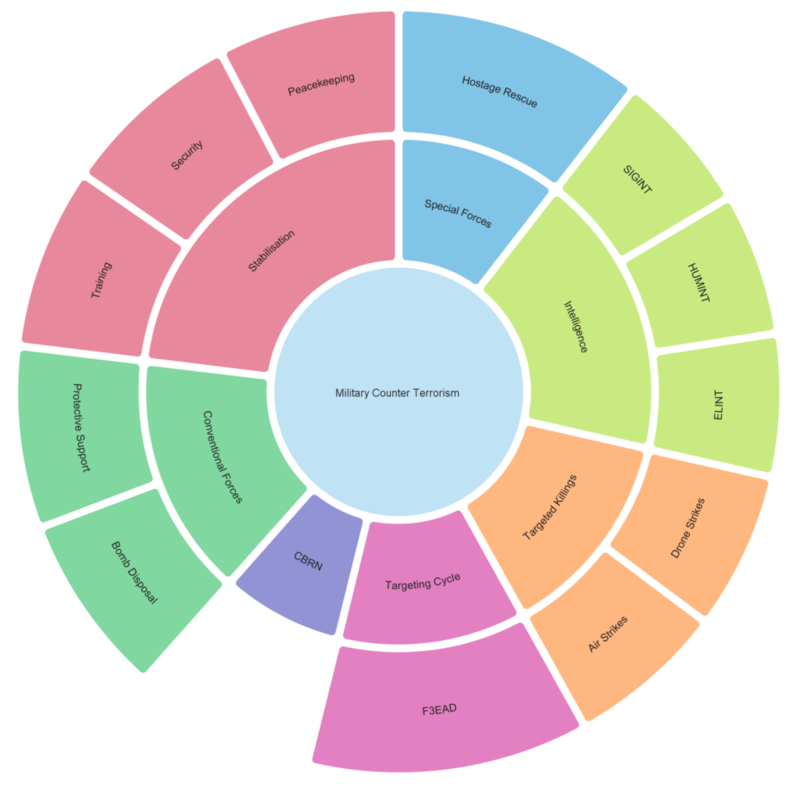 Deciding what to share, when and with whom is essential within the trust equation. Ideally, improved capabilities (across intelligence, technology, processes and procedures) will deliver increased security for the citizen as referent object. Major losses would be recorded on the balance sheet if counter terrorism capabilities were used to oppress. There is a further danger that stabilisation initiatives will fail and that improved counter terrorism capabilities will be leveraged by nefarious and hostile actors. The role of private security firms deserves additional consideration. From Executive Outcomes (Singer, 2008, pp. 101-118) to The Sandline Affair (Spicer, 1999, pp. 203-223) to Blackwater, their war-time and post-conflict involvement sparks debate. With numerous combat veterans on the payroll, some firms have operated independently or with limited oversight. Global governance of the privatised military sector is important to ensure that specialist tradecraft is not transferred to unpalatable actors. 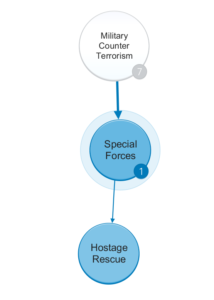 Assessing the operational effectiveness of military counter terrorism techniques within each of the five categories leads to a central conclusion. The applicability of each technique (in terms of ethics, proportionality and legality), its tactical and strategic efficacy as well as the nature and danger of blowback are highly complex and contextual. Simple efficacy measures could include numbers of disrupted plots, seizure of armaments, volume and quality of actionable intelligence, numbers of terrorists arrested, convicted or killed. Proxy measures for community support may include tips offs, reports of suspicious devices or activities. Blowback is unpredictable and risks exponential escalation of tension and the creation of new threats. Its indicators may include increased attack cadence and ferocity, new hostile actors or alliances, attacks in other regions or countries, diplomatic fall out and sanctions. Systematic thinking is needed to assess these variables and tune the policy instrument to deliver the maximal net outcome in each context. Scenario planning and game theory techniques may prove helpful in this regard. There are nuances to consider in terms of defensive and offensive counter terrorism postures. The blowback risk profiles of categories 2, 3 and 4 seem higher than those of 1 and 5. Constructing and testing well-ordered policy hypotheses would therefore seem prudent. The tempo of counter terrorism operations may not always facilitate upfront assessment of strategic impact. Decisive action may be needed to counter a sudden threat. Targeting, intelligence gathering and sharing, use of enhanced interrogation and detention without trial can and must however be assessed in terms of their long-term strategic effect. 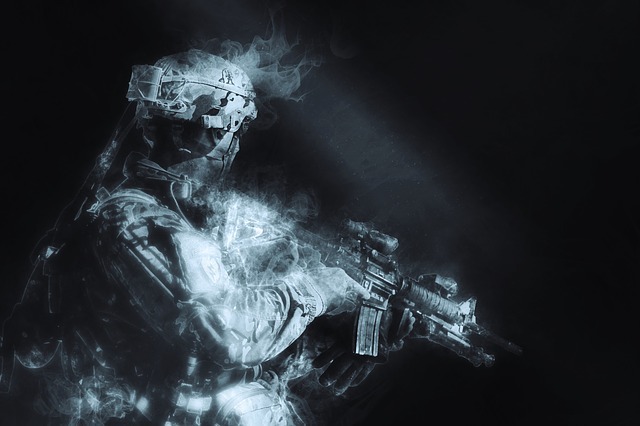 We really hope you found our article on Military Counter Terrorism Techniques useful and enjoyable. Aid, M. (2009) ‘All glory is fleeting: SIGINT and the fight against international terrorism’, in Andrew, C., Aldrich, R. J., and Wark, W. K. (eds) Secret Intelligence: A Reader. Routledge, pp. 40–77. Andrew, C. M., Aldrich, R. J. and Wark, W. K. (2009) Secret Intelligence: A Reader. Routledge. Bamber, D., Craig, O. and Elliott, F. (2003) ‘Blair sent in tanks after “chilling” threat’, Telegraph, February. Available at: http://www.telegraph.co.uk/news/uknews/1422243/Blair-sent-in-tanks-after-chilling-threat.html (Accessed: 12 March 2017). Bamford, B. (2009) ‘Intelligence in Northern Ireland’, in Andrew, C., Aldrich, R. J., and Wark, W. K. (eds) Secret Intelligence: A Reader. Routledge, pp. 259–280. Beckwith, C. A. and Knox, D. (1984) Delta Force : The US Counter-Terrorist Unit and the Iranian Hostage Rescue Mission. London: Guild Publishing. Bergen, P. L. (2013) Manhunt: the ten-year search for Bin Laden from 9/11 to Abbottabad. Broadway Paperbacks. Blackbourn, J. (2014) Anti-Terrorism Law and Normalising Northern Ireland (Routledge Research in Terrorism and the Law) eBook: Jessie Blackbourn: Amazon.co.uk: Kindle Store. Routledge. Bloxham, A. (2011) ‘SAS squads based in riverside bunker for London Olympics’, The Telegraph, 3 November. Available at: http://www.telegraph.co.uk/news/uknews/terrorism-in-the-uk/8866708/SAS-squads-based-in-riverside-bunker-for-London-Olympics.html (Accessed: 12 March 2017). Bumiller, E. and Shanker, T. (2012) ‘Panetta Warns of Dire Threat of Cyberattack on U.S.’, The New York Times, October. Available at: http://www.nytimes.com/2012/10/12/world/panetta-warns-of-dire-threat-of-cyberattack.html (Accessed: 11 March 2017). Cronin, A. K. (2011) How Terrorism Ends: Understanding the Decline and Demise of Terrorist Campaigns. Princeton University Press. Cronin, A. K. (2013) ‘Why drones fail: When tactics drive strategy’, Foreign Affairs, 92(4), pp. 44–54. doi: 10.1525/sp.2007.54.1.23. David, S. (2016) Operation Thunderbolt: Flight 139 and the Raid on Entebbe Airport, the Most Audacious Hostage Rescue Mission in History. Hodder Paperback. Drakos, K. and Giannakopoulos, N. (2009) ‘An Econometric Analysis of Counterterrorism Effectiveness : The Impact on Life and Property Losses’, Public Choice, 139(1), pp. 135–151. Gaskarth, J. (2011) ‘Entangling alliances? The UK’s complicity in torture in the global war on terrorism’, International Affairs, 87(4), pp. 945–964. doi: 10.1111/j.1468-2346.2011.01012.x. Harkin, G. and Ingram, M. (2004) Stakeknife: Britain’s secret agents in Ireland. O’Brien. Harnden, T. (2011) ‘Libyan arms helped the IRA to wage war’, The Telegraph, 4 April. Available at: http://www.telegraph.co.uk/news/uknews/northernireland/8425593/Libyan-arms-helped-the-IRA-to-wage-war.html (Accessed: 11 November 2016). Hartnett, S. (2016) Charlie One: The True Story of an Irishman in the British Army and his Role in Covert Counter-terrorism Operations in Northern Ireland. Merrion Press. Hewitt, S. (2008) The British war on terror : terrorism and counter-terrorism on the home front since 9/11. Continuum. Howard, T. (2016) Failed States and the Origins of Violence. Oxford: Routledge. Hughes, C. (2016) Secret 40-strong SAS team secretly flown to London following Nice terror attack, The Mirror. Available at: http://www.mirror.co.uk/news/uk-news/secret-40-strong-sas-immediate-8430895 (Accessed: 12 March 2017). Kilcullen, D. (2010) Counterinsurgency. C Hurst & Co Publishers Ltd.
Lawson, S. T. (2013) Nonlinear Science and Warfare: Chaos, complexity and the U.S. military in the information age. Routledge. Lowenthal, M. M. (2016) Intelligence: From Secrets to Policy. Sage. MacAskill, E. (2015) ‘British army reluctant to post troops on UK streets after terror attacks’, The Guardian, July. Available at: https://www.theguardian.com/uk-news/2015/jul/26/british-army-reluctant-post-troops-uk-terror-attack (Accessed: 12 March 2017). Maley, W. and Schmeidl, S. (2016) Reconstructing Afghanistan: Civil-Military Experiences in Comparative Perspective. Routledge. Matchett, W. (2016) Secret Victory: the intelligence war that beat the IRA. Matchett. Matthews, A. (2016) Armed soldiers patrol the beaches after latest terror attacks, Mail Online. Available at: http://www.dailymail.co.uk/news/article-3716974/What-s-like-holiday-France-Armed-soldiers-patrol-beaches-terror-attacks-leave-country-high-alert.html (Accessed: 12 March 2017). McCleery, M. J. (2015) Operation Demetrius and its aftermath : a new history of the use of internment without trial in Northern Ireland 1971-75. Manchester University Press. Merry, R. (1974) Tanks guard London airport; Arab attack on airliner feared, Chicago Tribune. Available at: http://archives.chicagotribune.com/1974/01/06/page/1/article/tanks-guard-london-airport-arab-attack-on-airliner-feared (Accessed: 12 March 2017). Miller, S. (2009) Terrorism and counter-terrorism : ethics and liberal democracy. Blackwell Pub. Moysey, S. P. (2007) The road to Balcombe Street : the IRA reign of terror in London. Haworth Press. Muendo, L. (2016) How Kenya played a vital, silent role in Entebbe, ‘the most audacious hostage rescue in history’, Times of Israel. Available at: http://www.timesofisrael.com/kenya-a-silent-partner-in-the-most-audacious-hostage-rescue-mission-in-history/ (Accessed: 19 March 2017). Nasaw, D. (2008) ‘US authorities say deceased scientist responsible for anthrax attacks’, The Guardian, August. Available at: https://www.theguardian.com/world/2008/aug/06/anthrax.usa (Accessed: 12 March 2017). Nye, J. S. (2017) ‘Deterrence and Dissuasion in Cyberspace’, International Security. MIT Press, 41(3), pp. 44–71. doi: 10.1162/ISEC_a_00266. Osaki, T. (2015) ‘Deadly sarin attack on Tokyo subway system recalled 20 years on’, The Japan Times Online, March. Available at: http://www.japantimes.co.jp/news/2015/03/20/national/tokyo-marks-20th-anniversary-of-aums-deadly-sarin-attack-on-subway-system/ (Accessed: 12 March 2017). Pandey, S. C. (2008) International terrorism and the contemporary world. New Delhi: Sarup & Sons. Pearson, W. and Firmin, R. (2011) Go! Go! Go! : The SAS. The Iranian Embassy Siege. The True Story. W&N. Ramsay, M. (2009) ‘Can the torture of terrorist suspects be justified’, in Andrew, C., Aldrich, R. J., and Wark, W. K. (eds) Secret Intelligence: A Reader. Routledge, pp. 411–429. Singer, P. W. (2008) Corporate Warriors: The Rise of the Privatized Military Industry. Cornell University Press. Spicer, T. (1999) An Unorthodox Soldier : peace and war and the Sandline affair : an autobiography. Mainstream. Steinhauser, G. (2015) ‘Belgium Deploys Military in Cities After Terror Raids’, Wall Street Journal, January. Available at: http://www.wsj.com/articles/belgium-to-deploy-soldiers-in-cities-after-terror-raids-1421482255 (Accessed: 12 March 2017). Urban, M. (1996) Big Boys’ Rules: The SAS and the Secret Struggle against the IRA. London: Faber and Faber. Urban, M. (2011) Task Force Black: The explosive true story of the SAS and the secret war in Iraq. Abacus. Wilner, A. S. (2010) ‘Targeted Killings in Afghanistan: Measuring Coercion and Deterrence in Counterterrorism and Counterinsurgency.’, Studies in Conflict & Terrorism. Routledge, 33(4), pp. 307–329.